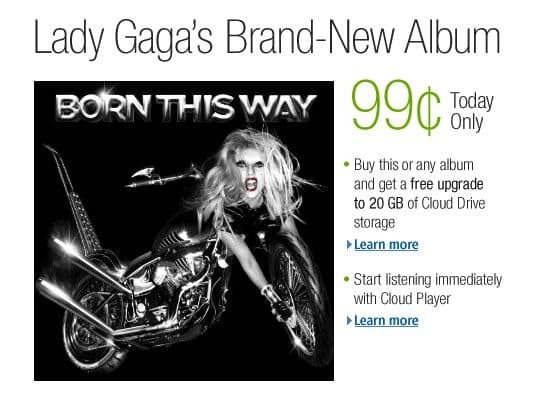 What better way for Amazon to promote its new “Cloud Player” than to offer Lady Gaga’s latest album, “Born This Way”—the entire album, mind you, complete with a digital booklet—for a mere 99 cents? Sounds like a pretty good deal, except scores of Amazon customers are now whipping up a storm after shelling out their 99 pennies, only to see as few as one or two Gaga songs out of 14 promised tracks appear in their digital lockers. Talk about a bad first impression. The promotion, which is only good for today (Monday the 23rd), lets you grab every track from Gaga’s new “Born This Way” album and either download the tracks as standard MP3 music files or stuff them into Amazon’s just-launched Cloud Player, an online storage locker that lets you stream your tunes on any PC or Android phone. Those who snap up Amazon’s Gaga deal are also being promised that their basic 5GB Cloud Player storage plans will be upgraded to 20GB for a year, with Amazon advising customers in the fine print that the upgrade could take “up to three hours” to process. The moral of the story? For customers … don’t be surprised if an almost too-good-to-be true offer like this one leads to a server-snaring stampede. And for companies like Amazon: if you’re going to sell one of the most anticipated albums of the year for just 99 cents, you’d better make it crystal clear to customers that they may not get instant gratification—particularly if you’re hoping to show off a new cloud-based music service. We’re currently experiencing very high volume. If you order today, you will get the full @ladygaga album for $.99. Thanks for your patience.